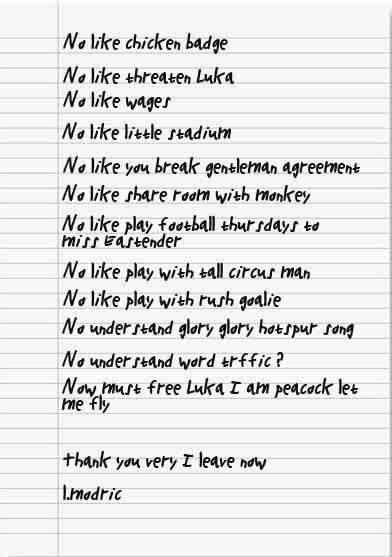 Luka Modric’s Official Written Transfer Request Leaked! is the monkey Gareth Bale? Yeah. Hahahahaha. He is foreign. Hahahahahaha. He can only write in crayon. Hahahahahahaha. Foreign. I was struggling there Petty Pete, but you cleared it up for me. Looks more like Felt Tip Pen to me hahahahahahahaha! it looks too fake. all of the same letter looks exactly the same. looks typed up.